I had the exciting chance to do a Number Talk with a 1st grade class last week! Looking back to where these students ended the year, I was fairly comfortable starting with ten frames and entering into talking about teen numbers within this context. 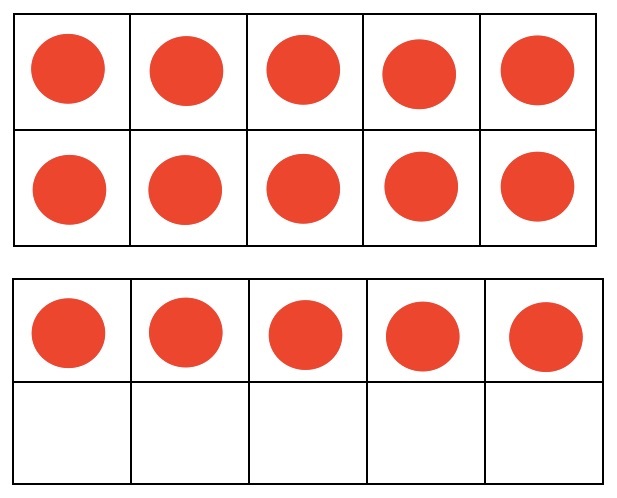 The students had some wonderful explanations of how they saw the dots and established how they just knew the ten if it was full. Some added on by ones to 15, some knew 10 and 5 was 15, some counted by 5’s to 15 and then one student some creative grouping vertically by 6,6,and 3. So I then pushed them a bit on how they recorded the equations and I was excited to quickly get 10+5= 15 and 5+5+5=15. “After the equal sign can only be one number, no plusses. 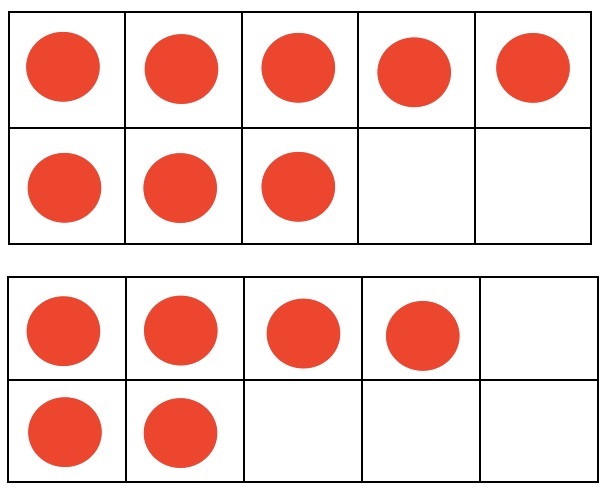 If you changed those lines (equal sign) to a plus, then maybe it would be right.” In reading Thinking Mathematically and Connecting Arithmetic to Algebra, I am finding this is a huge misconception that students build from K.
I asked the students who thought it was right to explain why and I got two uniquely different ways of thinking algebraically about this equation. “They are the same because 10+5 is 15 and 5+5+5 is 15 so they are the same.” This student is looking for balance, this side equals that side so it is equal. I could assume that given 12 + 6 = _ + 5 + 6, this student would think they need 7 more in the blank to balance both sides. “The 10 is a 5 and a 5, so it is the same as the other side.” This seemed quite different to me. It felt like a symmetrical way of looking at equations. He decomposed the numbers to prove they were equal by the way it looked. I could assume that given 12 + 6 = __ + 5 + 6, this student may decompose the 12 to 5+7 to find 7 is the number that goes in the blank to make it look equal. A bit different and something I really hadn’t thought about until now. These were the last two in my talk that I did not get to because these 1st graders had so much to say about the first two and I had so much to learn! Looking forward to working so much more with these kiddos! This entry was posted in Uncategorized on September 13, 2015 by mathmindsblog.